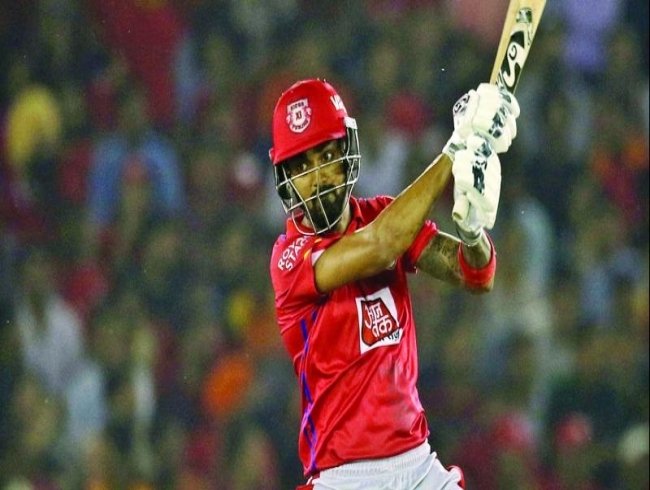 Mohali: KL Rahul’s unbeaten 71 and his 114-run stand for the second wicket with Mayank Agarwal guided Kings XI Punjab to a thrilling six-wicket win over Sunrisers Hyderabad here on Monday. The low-scoring game was decided only in the penultimate ball of the match. Mayank’s dismissal triggered a mini collapse as Punjab slumped from 132 for two to 140 for four in 19 overs. They needed 11 runs off the last over. Rahul held his nerve to take Punjab past the finish line. Earlier, David Warner struck his fourth fifth of the season before Deepak Hooda played a cameo in the final over to lift Sunrisers Hyderabad to a challenging 150 for four against Kings XI Punjab in an IPL match here on Monday. Opening the batting, Warner carried on his bat for an uncharacteristic 70 not out off 62 balls balls to anchor Sunrisers’ innings but it was Hooda’s unbeaten 14 off three deliveries that provided the late thrust to the visitors’ innings. The early dismissal, together with some disciplined bowling from Kings XI, made life difficult for Sunrisers batsmen as Warner and new man in Vijay Shankar (26) found the going tough. Sunrisers Hyderabad: David Warner (not out) 70, Jonny Bairstow c Ashwin b Mujeeb Ur Rahman 1, Vijay Shankar c Rahul b Ashwin 26, Mohammad Nabi run out (Ashwin) 12, Manish Pandey c sub (KK Nair) b Mohammed Shami 19, Deepak Hooda (not out) 14. Extras (LB-5, W-3) 8. Total (for four wickets in 20 overs) 150. FoW: 1-7, 2-56, 3-80, 4-135. Bowling: Rajpoot 4-0-21-0, Mujeeb 4-0-34-1, Shami 4-0-30-1, Ashwin 4-0-30-1, Curran 4-0-30-0. Kings XI Punjab: KL Rahul (not out) 71, C. Gayle c Hooda b Rashid Khan 16, M. Agarwal c Shankar b Sandeep Sharma 55, D. Miller c Hooda b Sandeep Sharma 1, Mandeep Singh c Hooda b Kaul 2, S. Curran (not out) 5. Extras (lb 1) 1. Total (for four wickets in 19.5 overs) 151. FoW: 1-18, 2-132, 3-135, 4-140. Bowling: Kumar 4-0-25-0, Sandeep 4-0-21-2, Rashid 4-0-20-1, Nabi 3.5-0-42-0, Kaul 4-0-42-1.